Uh oh, here comes another one of those challenges! and this one I’m definitely doing again. We have a neighbor who is always bringing us things to try. We get vension when he goes deer hunting, country ham when he goes back to Kentucky for a visit and this trip when they came back from South Texas we received a bowlful of oranges. Since this challenge involves oranges, I though I would put these fresh oranges to work and take them a big piece of this dessert. I have to admit, I have never heard of an Orange Tian. If you have, then you are one step ahead of me. This challenge involved make a pate sable (crust), orange marmalade, segmenting oranges, making a caramel sauce, and doing a whipped cream where you mix in gelatin. 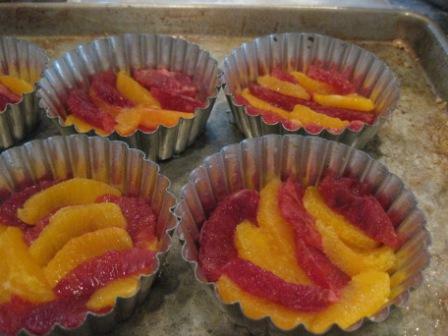 I decided to do mine in these cute little tart pans that have been gathering dust in my pantry. I am doing a technique class at Williams Sonoma tomorrow on pie crust. I’m not doing the pate sable crust but we are doing a pate brisee and pate sucre and a crust made with saltine crackers. I have never heard of the pate sable crust but after studying up on what I’m going to be making in class found out that the sable crust has a lot more sugar and the sucre crust. I makes it more like a cookie crust. 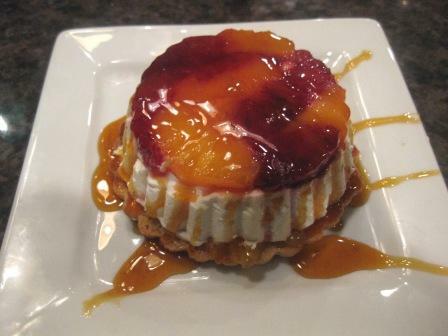 After making this dessert I knew I would be making it again. It was/is a beautiful dessert. It can defnitely be made in stages. The crust could be made days in advance and frozen. The orange marmalade can be done in advance and putting it together is a breeze. Now, if you aren’t into making your own orange marmalade or caramel sauce, just buy it ready made. But believe me the marmalade was really easy and looked so much better than the stuff that comes out of a jar. I’m a true believer that ANYTHING homemade is better that store bought. Just think of all the love you put into the dish when you are doing it from scratch. The caramel sauce wasn’t that big of a deal to make but you want to watch it carefully because the sugar gets really hot and you don’t want to burn yourself. 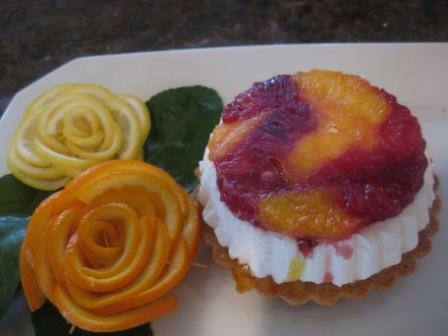 The orange and lemon flowers on the plate with the dessert are really easy and quick. I can make one in less than 10 minutes. I normally wouldn’t put the orange flower on the plate because it is so big. But, I have used them on trays for garnish. The lemon or lime flower would make a nice garnish, but who wants to do that many flowers? I would cut maybe citrus butterflies for a plate garnish. Segmented oranges. Easy to do and you can watch a YouTube video on how to do it. 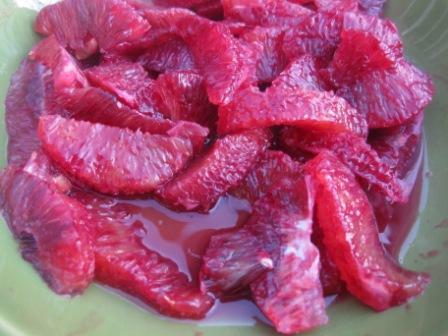 Aren’t these blood oranges beautiful. 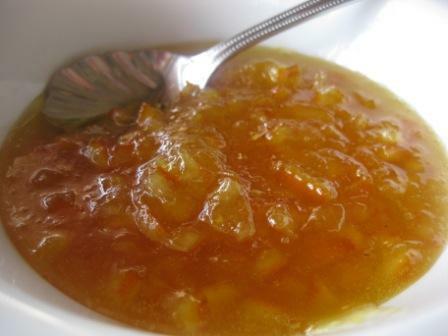 This marmalade was so easy to make. You just blanch one sliced orange three times and then chop up and cook awhile with sugar and some pectin. I’m wanting to try grapefruit marmalade or blood orange marmalade the next time I make marmalade. The crust is easy to make and can be made ahead and frozen. I did this dessert in my 4″ removable bottom tart pans. I think you could just as easily use a tuna can or tomato sauce can. You will just need as many cans/rings as you want to make desserts. Roll out the dough onto a lightly floured surface until you obtain a ¼ inch thick circle. 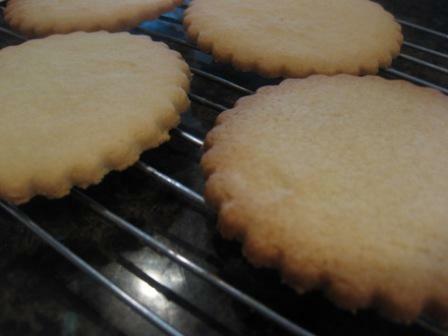 Using your cookie cutter, cut out circles of dough and place on a parchment (or silicone) lined baking sheet. Bake for 20 minutes or until the circles of dough are just golden. Thinly slice the orange. Place the orange slices in a medium-sized pot filled with cold water. 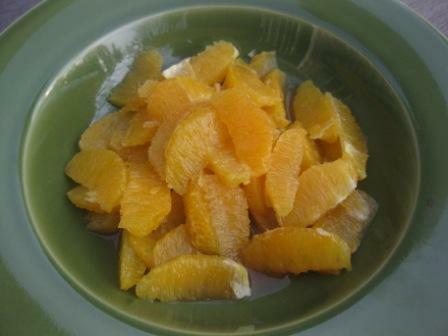 Simmer for about 10 minutes, discard the water, re-fill with cold water and blanch the oranges for another 10 minutes. Once blanched 3 times, drain the slices and let them cool. Once they are cool enough to handle, finely mince them (using a knife or a food processor). Weigh the slices and use the same amount of granulated sugar . If you don’t have a scale, you can place the slices in a cup measurer and use the same amount of sugar. 1 ½ c. orange juice + 2 Tbsp. Place the sugar in a pan on medium heat and begin heating it. Once the sugar starts to bubble and foam, slowly add the orange juice. As soon as the mixture starts boiling, remove from the heat and pour half of the mixture over the orange segments. Reserve the other half of the caramel mixture in a small bowl — you will use this later to spoon over the finished dessert. When the dessert is assembled and setting in the freezer, heat the kept caramel sauce in a small saucepan over low heat until it thickens and just coats the back of a spoon (about 10 minutes). You can then spoon it over the orange tians. [Tip: Be very careful when making the caramel — if you have never made caramel before, I would suggest making this step while you don’t have to worry about anything else. Bubbling sugar is extremely, extremely hot, so make sure you have a bowl of ice cold water in the kitchen in case anyone gets burnt! Line a small tray or baking sheet with parchment paper or a silicone sheet. Lay out 6 cookie cutters onto the parchment paper/silicone. Drain the orange segments on a kitchen towel. Arrange the orange segments at the bottom of each cookie cutter. Make sure the segments all touch each other and that there are no gaps. Make sure they fit snuggly and look pretty as they will end up being the top of the dessert. Arrange them as you would sliced apples when making an apple tart. Place the desserts to set up in the freezer to set for 10 minutes. Wow, that is absolutely beatuiful. I could never imagine making something so amazing. You are talented! Thanks for supporting my blog. This one is definitely being bookmarked. I love orange marmalade. This is such a colorful dessert. I love it! Looks just great! I had never heard of a Tian before either. Love your combination of oranges too…! Your presentation is beautiful with the lovely orange garnishes. Great work! Love your version of it! !